At the end of the last post, I started talking about the chromatic scale. I’m going to back up a bit and expand the idea of single notes as non chord-tones, and talk about non chord-tones as part of arpeggios. Think of single notes as being letters and arpeggios as being words. A phrase, then, is two or more arpeggios played in a sequence. So let’s take a single chord: a G major triad. Its chord-tones are: G, B, and D. Obviously, the G major arpeggio works, but what about all the other arpeggios in the key of G? Let’s take a look. The A minor arpeggio has an A, a C, and an E. No chord tones, so we’ll label that as tense. The B minor arpeggio has a B, a D, and an F#. This one is way more consonant with two chord-tones form the G major triad, and the 7th of a G major 7 chord. The C major arpeggio has C, E, and G. Two non chord tones and the root of the G major triad. More consonant than the A minor triad, but less consonant than the B minor. The D major triad: D, F#, A. One chord tone and the 7th of G major 7. E minor triad: E, G, and B. Consonant like the B minor triad – two chord-tones and one non chord tone. Finally, the F# diminished triad, which has F#, A, and C. this is probably the most dissonant triad of the key when played against the G major. The takeaway is that you can plot the amount of tension you want to produce against a single chord. And yes, there is almost always more than one chord in any song. This means things can get complex pretty fast. It’s a lot of work to learn how to use arpeggios like this, but the payoff is enormous in terms of technique and ear training. Make it enjoyable (and not overwhelming), by just learning the arpeggios in the key of G for now and then playing them over a recorded G major chord. I’ve put these all on the same two strings to make it a bit easier to play. This way you can get the tension/resolution sound in your ear faster. I’ll talk about playing them all in the same position in the next post. I’ll also talk about not playing them in sequence like this. It gets old fast. 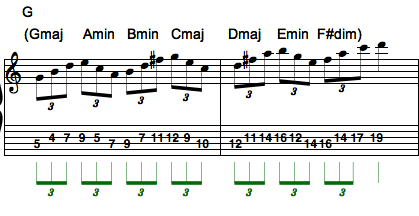 As a technical exercise, see if you jump randomly from chord to chord smoothly (i.e. Gmaj to Cmaj to F#dim to Dmaj, etc.). Go as slow as you need. As an ear exercise, repeat one of the more consonant arpeggios at least five times. Then play one of the more dissonant ones. Then reverse the process. Repeat a dissonant arpeggio five times, and follow it with a consonant one.